A way to prevent and correct mistakes through smarter design. The focus of user experience design is to put the needs of the users first. This is accomplished by providing users with the controls and content they need & want, but it is also accomplished through preventing users from making mistakes. Shigeo Shingo was a Japanese industrial engineer who was celebrated for improving manufacturing practices at Toyota among other companies. In the 1960s, in an effort to improve manufacturing assembly lines, he created poka-yoke. Poka-yoke is the concept of preventing/stopping mistakes through smarter design. For example if a machine required a worker to only press a button with their right hand, their left hand could still accidentally be hurt by the machine. So the machine would be redesigned to only operate if you pressed one button with your left and a second button with your right hand, ensuring that both hands would be clear of the machinery. Poka-yoke looks to prevent a mistake and teach you the correct method at the same time. Poka-yoke is seen in our daily lives in a variety of things. 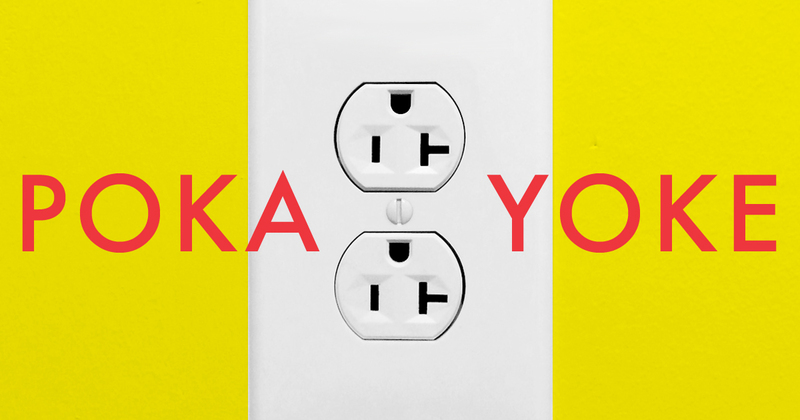 Electrical plugs are designed with different sized plugs so they can only be plugged in one way, preventing you from making a mistake. Some cars require pressing the brake before you can move the car out of park to prevent the car from moving before the driver is ready. Child-proof pill bottles include an extra step to prevent children from opening the bottles. Surgeons and pilots follow procedural checklists to avoid simple mistakes and ensure safety. Most user experiences are open-ended allowing users to filter and move between pages with few restrictions. However, when following a serial process (such as the checkout process in e-commerce), or closing an unsaved file, UX designers use poka-yoke to prevent mistakes. In e-commerce, designers will remove unnecessary navigation that could take the user away from completing the checkout. When attempting to close an unsaved document there is an interstitial / chicken message warning you so you can save the document and avoid losing your work. Looking for a way to identify and avoid making mistakes in your #UX? Try #pokayoke. Give your users instructional text on how to get started. Use bookmarks to help users see logical combinations of selections right for analysis. Incorporate help text to explain technical terminology. Have users complete all the necessary input fields of a calculator before proceeding to the next step. Explain where the data comes from. Include parenthetical text in list boxes telling the user how many results each value has to help avoid pogo sticking before they even make a selection. For pages that are focused on one piece of analysis, like a specific tool, don't give the users more options than they need to operate what is on the page, etc. The good news is that Qlik's green, white, & gray already serves poka-yoke by teaching users how to see relationships in the data as well as how to make additional selections that will yield results. Help your users by guiding them towards the best user experience possible to get the most out of their data.